1988 Ford Taurus 3.0 V6 Estate. I have been attempting to spot one of these for some time, quite possibly one of my favourite American cars, and one which will remain well known due to the nigh on groundbreaking styling when it was released, much like an American version of the Sierra, although I am unsure if it came with such an initial nervous response from the buying public. 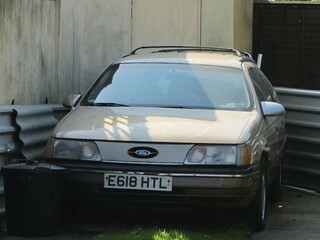 Imported in to the UK in 1998, this one is currently on SORN, but hopefully it will return to the road eventually. I imagine spares would be difficult to source over here though.